Another contest that FFM have join this month of February and this will end in March 02, 2012. 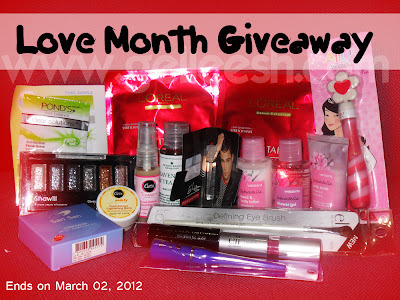 Winner can win: ELF Defining eye brush, Penshoppe's Ed Westwick Signature Eau de toilette, Shawill 6 color cream eyeshadow, ELF lipstick in Gypsy, EB Pro lipstick with shimmer in burgundy, Allue Flower lipgloss pen in felicia, Sansan Age defense liquid eyeliner black, Sansan concealer natural, Pond's, and many more. To join just click the image and it will lead you to her site of giveaway where you can also find the rafflecopter for this contest. Goodluck!